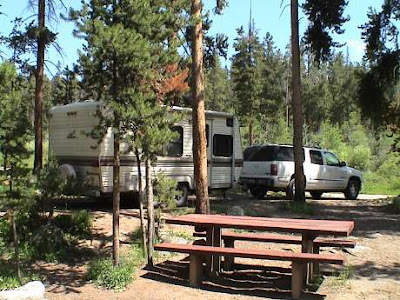 Courtesy of our neighbors: how to keep a campsite/campground to yourself on a busy holiday week. Our neighbors decided to take their kids camping over the holiday weekend and headed out towards Mt Hood. Not surprisingly, the first couple places they got to were already full. Finally they found a campground that was empty except for a camper in one campsite. They pulled up to another campsite and started to unload. While the kids and the Dad were starting to set up the tent, the mom started to walk around with their dog. He was running in circles around her and getting a little far. At one point he ran over maybe 40 feet from the camper. Now, while he is an absolutely sweet dog, it must be said that he can look a little scary (slightly reminiscent of a pit bull or other similar dog). But still. Just as our neighbor started to call him back over to her, a man came out of the camper with a handgun and without saying anything to her, pointed it at the dog and cocked the hammer. At which point our friends grabbed the dog and their kids and high tailed it to a more crowded, but hopefully small arms-free place to camp for the weekend. Needless to say, I think the man was probably successful at keeping his camping solitude.